Mountain Hollow Farm Yarn Retreat: All Yarn, All Weekend! for upcoming Mountain Hollow Farm Yarn Retreats! The retreat registration fee covers everything – except your room and optional KAL and CAL – and it is payable to Mountian Hollow Farm via the link at the bottom of this page. Your room reservations must be made directly with Pine Mountain State Park, and is explained below. Show & Tell – It’s always a hit! Bring an item you made and show it off to the rest of us. Call (800) 325-1712 anytime. 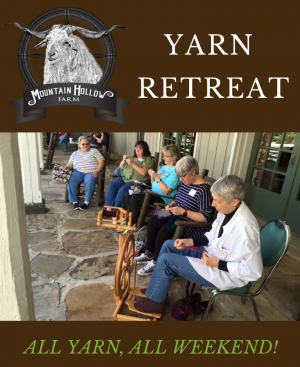 Mention “Mountain Hollow Farm Yarn Retreat” or group code 1918 to receive these special rates. Visit Pine Mountain State Resort Park’s web site. Use group code 1918 to receive these special rates. Learn how to knit or crochet a moebuis! The KAL and CAL are optional activities, but many retreat attendees enjoy them. The yarn we’ve chosen for these projects is Apple Tree Knits Gradients – beautifully dyed gradient yarn in 100% superwash merino wool. We’ve assembled kits for these projects. If you would like to participate, be sure to order your kit when you register so that we have it ready for you when you arrive at the retreat. The Smoky Mountain Moebius Cowl pattern is written by one of our regular retreat attendees, Leedra Scott. The pattern is done in worsted weight yarn and a 40″ or 47″ size 8 circular needle. The kit below includes the pattern and one 4 ounce skein of Apple Tree Knits Plush Worsted Gradient, in the color you choose. The Merriwa Moebius pattern is written by Sharon Boswell. The pattern is done in DK weight yarn and a 4.5 mm hook. The kit below includes the pattern and one 6 ounce skein of Apple Tree Knits Plush DK Gradient, in the color you choose. After you select your option(s) for the KAL or CAL, use the back button on your browser to return to this page and scroll down to add your retreat registration to your cart. If you do not want to participte in the KAL or CAL, scroll down to register for the retreat. NOTE: If you’ve been to prior retreats and registered online, there may be a note below that you have ticket(s) for this event. These ticket(s) are probably for past retreats, not for the current retreat. If you are not sure if you registered for THIS retreat, click the “View your Tickets” link to check the date(s) of your ticket(s). Any ticket(s) for THIS retreat will have a date of April 2, 2019 or later.